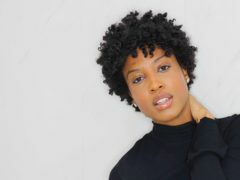 Let me tell you, I have been trying to Flexi Rod my hair since before I decided to go natural. I’ve seen so many photos of black women with these perfectly spiraled and full curls that they achieved by using Flexi Rods, and wanted in. I’ve been doing my own hair for a very long time so I figured this wouldn’t be that difficult. I’m pretty good at perm rods, what’s the difference? I watched one or two videos and thought I was a pro. That just wasn’t the case! It took time and many failed attempts but eventually, I got it! Below are some tips from me as well as a full step by step video tutorial outlining my process and products. It’s All About Technique. First off, I couldn’t get the technique down for twisting my hair onto the rod and making them not fall out. Unlike perm rods, there isn’t a small strap or closure so it’s all about how you roll and bend them that helps the rod to stay in place. I found that rolling from the end of my hair upward was not only easier, but helped achieve a more neatly spiraled curl. Also, the way your hair is wrapped around the rod is important — because you can come out looking like Shirley Temple if its too gathered. Products, Products, Products. As mentioned, I began using Flexi Rods before I decided to go natural and when I relaxed my hair I tried to stay away from using too much product when styling. I already had pretty oily hair and didn’t want anything to weigh it down. 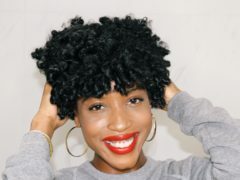 However, what I find when doing a Flexi Rod set is that more product is better and it is all about using the right products for our hair. When doing a Flexi Rod or Perm Rod set it’s best to use products that have a great hold, but do not make my hair crunchy or stiff once dry. That’s why I love the Mielle Brazilian Cocktail Curl Mousse ($13.99) and Eco Styler Gel ($5.69) that I mentioned in my last post. Size Does Matter. I fluctuated a lot with the size of the Flexi Rods I used, but now I’ve come to realize that I really love the medium to larger sized rods. In my opinion, they give my hair a bit more bounce. The only down side is that the larger rods take a bit longer to dry. It really is all a matter of preference and the specific look you’re going for. Also, don’t go off of how a particular size makes one person’s hair look, everyone’s hair takes to rods differently. I say play around with a few different sizes before settling on just one. Be Patient, Make Sure it’s Dry. This has honestly been the second most difficult part of the Flexi Rod experience for me — drying. I tried to have them air dry several times, but to no avail my hair would always be damp when I had to take the rods out. I am super cheap and the trusty hair dryer I’ve had for about 5 years now was on it’s last, so I sadly had to invest in a new one. Trust me, having half dry curls doesn’t do you any good when removing the rods. I understand applying heat to hair is a concern, and I haven’t used any heat styling tools (flat iron, curling iron, curling wand etc.) in a few months. However, a hooded dryer really comes in handy with this style and you don’t have to put it on the hottest setting. Don’t Have Separation Anxiety. This is something I would never do at first because I just wanted to shake and go, but I’ve come to realize is very very important. Once all of the Flexi Rods are out, I take some oil and slowly go through each curl, separate and finger coil to make them look fuller. If you have to, start getting ready a little earlier to save yourself some time to get this last step in. I also take a ‘fro pick and tease my roots some as well. Trust me, it makes the style look so much more natural! I know you’re probably tired of reading this and want to get to the tutorial. Here it is! 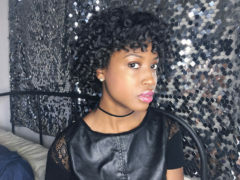 A step by step guide on how I achieve the best Flexi Rod set for my transitioning hair. I really hope it helps you, I know how difficult this style can be!